If you are not practicing yoga, then you may need to rethink about it. Those who are practicing yoga regularly, may not aware of one more benefit of practicing yoga to their body. Do you know when you are doing Surya Namaskar or Sun Salutation or any Yoga pose -your gene expression might be changing for better! On International Yoga day, something we all need to know is, ancient Yoga practice always helped our ancestors not only in keeping mind calm but also helped in boosting immune cells to fight against various conditions. Yoga is known to improve wellness in healthy people and have benefits for patients. Yoga is linked to not only lower stress levels but also it reduces back pain, increases bone health, gives relief from depression, reduces sugar level etc. The mechanisms of how yoga positively affect the mind-body system was unknown till recent years. The mechanism or how these positive effects are enacted was not that well known till recent years. Various research publications that tested benefits of Yoga intensively justifies the benefit of Yoga for human body. 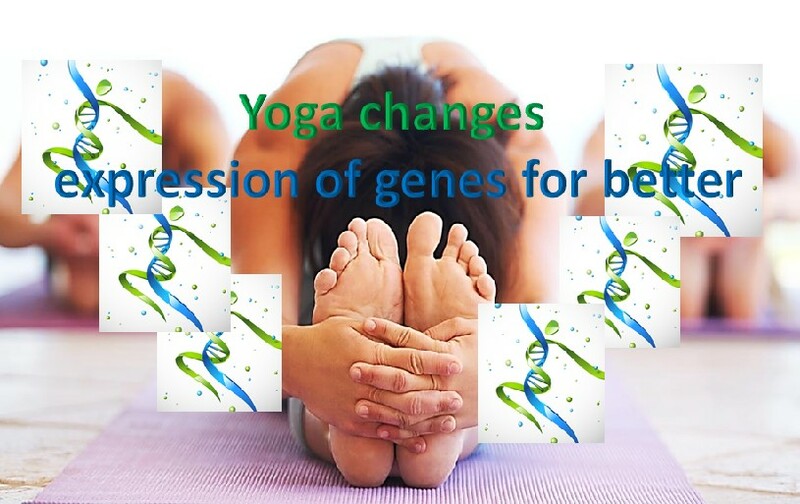 Research from past few years has demonstrated that mind-body practices including yoga that initiate the relaxation response may result in enduring changes in gene expression. Research from the University of Oslo (2013) has determined that yoga practices can have an almost immediate impact on gene expression, particularly in immune cells. Results published in PLOS One journal reveals the genetic evidence that proves yoga’s impact on immune system. In this study researchers examined 10 participants who underwent a week long yoga retreat where they did meditation, yogic postures and yogic breathing exercises. Examining the participants’ blood before and after four-hour yoga sessions showed that the yoga practice changed the expression of 111 genes in circulating immune cells. In contrast, music and walking-based relaxation changed the expression of 38 genes. Study showed that practicing Sudarshan Kriya and other yoga Practices (SK & P) were compared with simple walks and listening to relaxing music. The results show that the SK and other yoga practice (SK &P) program has a rapid and significantly greater effect on gene expression in PBMCs (peripheral blood mononuclear cells) compared with the control regimen. These findings suggest that effects of yoga practices have an integral physiological component at the molecular level which is initiated immediately during practice and may form the basis for the long-term stable effects. In summary the ancient yoga is very effective than the other exercise regime and gives more health benefits through positive impact on the genetic level.